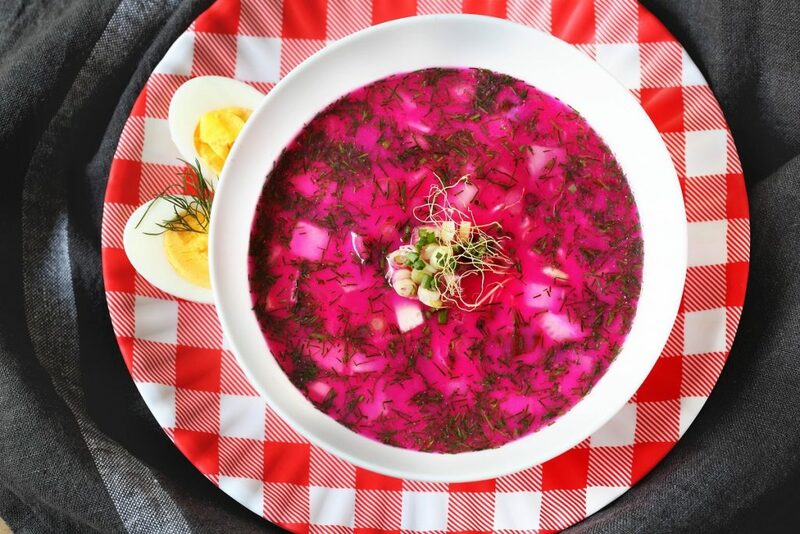 You are here: Home » Bel-Feast Brings a Taste of Russia to Washington D.C.
A bowl of Belarusian cold borsht from Bel-Feast paired with eggs and scallions is the perfect way to cool down during the summer months. Photo Credit: Alex Varabei. On a sweltering hot Thursday afternoon, I was making my way through the lunch hour crowd in Farragut North Square in Washington D.C., visualizing my next story. The temperature must have been at least 85 degrees Fahrenheit — a high for early September — as the sun hit my back, making me wonder why I decided to choose this particular day to grab lunch outside. As I swerved from right to left and left to right, desperately trying to avoid a collision with the flurry of tourists and buttoned-up professionals coming right at me, my stomach let out a deafening cry. Certainly one that was louder than the newborn baby in the stroller behind me, and loud enough for me to hear despite OneRepublic’s “I Lived” blasting in my ears. And just like that, all of my detailed thoughts of productivity and writing went out of sight and mind as images of savory food and fragrant spices quickly replaced them. I admit, walking on an empty stomach during lunch hour probably wasn’t the best idea. I needed sustenance, and I needed it fast! That’s when it hit me: the all-too-familiar smell of chicken blini and sautéed onions. I had to find the source of this aromatic dream. Luckily, I didn’t have to look far. 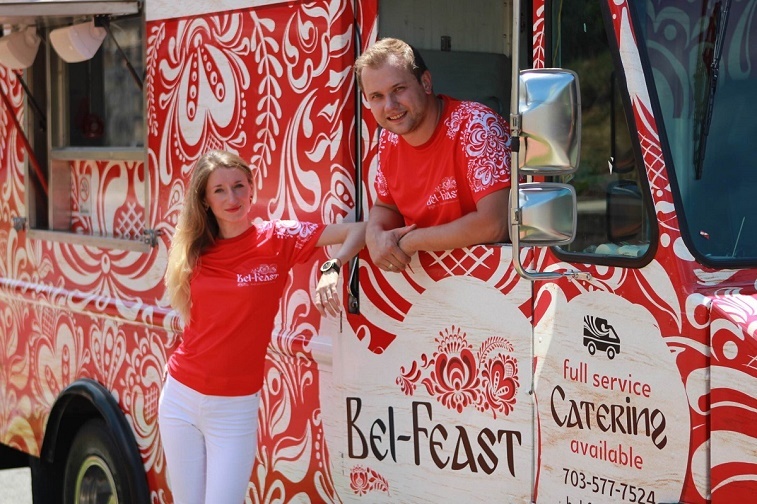 Turning on my heels, I immediately came face-to-face with Bel-Feast, a bright red food truck covered in white art motifs, reminding me of the lace found on a babushka’s apron. Painted on the truck next to the opening were brightly colored bowls of borscht, pierogis and pelminis, conjuring up childhood memories of my grandmother cooking in her small kitchen. But it was its message and not its art that was its true calling card. Advertising itself as “food with a Russian accent,” the truck prides itself in being the only Eastern European-inspired food truck on the East Coast. This alone made it impossible for me not to stroll over. I wanted a taste of Russia. Alex and Kate Varabei, the owners of Bel-Feast. Photo Credit: Alex Varabei. Incorporating influences from neighboring countries like Belarus, Georgia, Ukraine and Poland, Belarus-native Alex Varabei — Bel-Feast’s proprietor and cook — makes sure his ingredients are fresh every single day. To ensure freshness, he bakes the bread and some of the filling at night, and finishes the rest in the morning before opening. And to maintain authenticity, Varabei tells me that a lot of his ingredients have to be shipped from New York City: A city not only known for being a foodie paradise, but for being home to the largest Russian population in the United States. Apart from Russia itself, it doesn’t get any more authentic than that. With the line short and moving quickly, my food was ready to go after only having to wait five minutes. Plate in hand and a smile to match on my face, I looked around for a tiny corner in the shade to enjoy my meal: a chicken blin, fresh kale salad, and a small bowl of Belarusian cold borscht. The broth was smooth and chilling, sending goose bumps down my entire body. And while it didn’t have a very noticeable scent, the flavor was rich. There was just something magical about the sweetness of the scallions and beets paired with the sourness of the yogurt. My culinary journey to Russia didn’t end there, though. Opening the lid of the plastic container sitting in front of me, I heard my stomach growl again as I gently fanned my hand above it, making the smell of the blin waft through the air and into my nose. Taking a considerable bite, the creamy chicken mixed with the oregano and heavy cream made my heart swoon. With eyes closed, I could almost picture the Ural Mountains in the distance. My favorite parts of the blini have always been the sweetness of the crepe and the creaminess of the sauce. Honestly, if I had more time and a bigger stomach, I would have ordered a second helping. Of course, the perfection of this meal shouldn’t have surprised me, given blini are their most popular order among returning customers. And their dishes aren’t only limited to omnivores. If you prefer meatless options or are just trying to stick to a diet, Bel-Feast offers those as well, with potatoes and mushrooms serving as alternatives to the standard meat and chicken stuffing. With my blin devoured, Varabei waved me back over and handed me a glass of Kvass — a fermented beverage made from rye. Delicious. Cool. Refreshing. “Food trucks are better than restaurants because they are mobile,” Varabei says. “So when business is slow, you can just change spots.” What a great philosophy. No one likes to be tied down, plus there are at least 10 “hot spots” for food trucks in the area, he tells me. Varabei’s American Dream came true in July 2015 because of this bright red food truck that now stood before me. Finding his way out of the construction and moving business and into the kitchen, he mixed traditional flavors with modern ones, adapting them to the American palate. “Everything is better with experience and a little spice,” he says with a wink. The originality of the food paired with the fresh ingredients already makes Bel-Feast a great establishment, but what ultimately raises the bar is the price. My entire meal cost less than $10. Let me remind you what I had ordered: a large chicken blin, kale salad, cold borscht, Kvass, and a Russian lemon soda. Needless to say, I left the area with a happy and full stomach and wallet. Our recommendation: For only $7.99, we recommend the fried pelmini. These fried golden dumplings filled with a mixture of onion, beef, pork and chicken won’t disappoint you. Customer favorites: Some of the most popular items, according to Varabei, are the meat blini (beef or chicken, $2.99), the classic or mushroom borscht ($4.99), and the fried vegetable pierogis (made with potato and mushrooms, $6.99). Hours of operation: 11 a.m. to 2 p.m. EST, Monday through Friday. Location: The Bel-Feast food truck travels around the Washington D.C. area. We recommend checking the website for its location on any given day. They also offer catering. Tags: Bel-Feast, blinis, dumplings, featured, metered, pierogi, Russian food, Washington D.C.